Most of us choose to use condenser mics for the majority of our studio work, an approach which has been greatly encouraged by the very affordable offerings now available from China. However, other microphone types are available, and ribbon mics have been making something of a comeback in recent years. Photo: Mike CameronThe ribbon mic was the transducer of choice in the early years of high-quality recording, and although largely overtaken by the ubiquitous capacitor mic it still has niche roles, particularly for recording string sections, brass, percussion, and the voice — both spoken and singing. Ribbon mics generally have a very low output, which places huge demands on the preamplifier, but technological advances now mean that there are a large number of preamps available which can provide sufficient gain without detracting from the inherently low noise floor of a ribbon microphone. American recording engineer Wes Dooley set up Audio Engineering Associates (AEA) in Pasedena, California, and provides a wide range of audio equipment and services — including, apparently, a lot of forensic work. The company's catalogue makes fascinating reading, as it contains, amongst other things, intriguing accessories for stereo and surround recording, elaborate studio booms and stands, Decca trees, M&S decoders, and phase monitors. There are also vintage-style microphones which turn out to be table lamps, or empty shells designed to house modern microphones for use on TV chat-show presenters' desks! 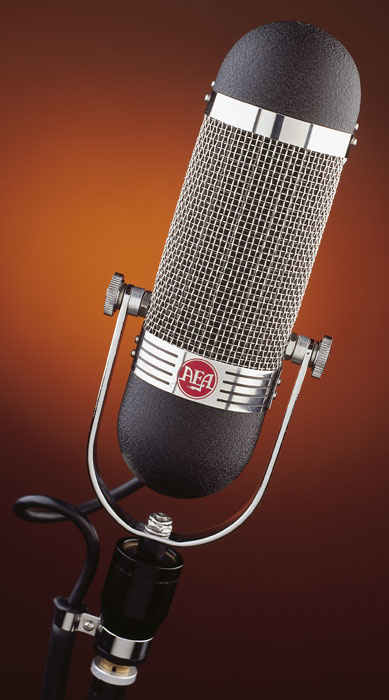 More seriously, the company also produces a range of hand-built ribbon microphones, including the R44C, an authentic recreation of the original 1936 RCA 44 mic — a classic design which is highly regarded and sought after today — reviewed in SOS June 2002. 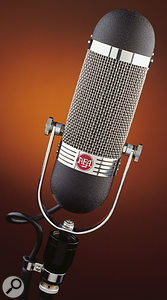 In fact, AEA have been working with high-performance ribbon microphones for over 20 years, and the subject of this review is another 'large ribbon geometry' microphone, called the R84 — but this time the mic has been designed from the ground up for the modern studio, rather than being a recreation of a vintage model. This new mic is also a lot more affordable than its big brothers, costing about a third as much as the R44C in the UK, although many would still categorise it as an expensive high-end microphone. Like most ribbon mics, the R84 has a bidirectional or figure-of-eight polar pattern, and it has been designed to provide a very wide bandwidth with a good transient response. The microphone has been optimised for close working applications as a spot or solo mic for brass, strings, percussion, electric and bass guitar, and of course voices. Consequently, it has a proximity effect (a characteristic which is often a tad overpowering in ribbon mics intended for more distant placements) which is unusually well-controlled. The ribbon itself is the same size as that used in the R44, measuring 60 x 4.7mm (2.35 x 0.185 inches), and it is claimed to be twice the size of the elements employed in many other modern ribbon mics. The advantages are said to include greater headroom (over 165dB SPL above 1kHz for one percent THD) and a smoother response at the frequency extremes. Mounted with relatively low tension, and being just two microns thick, the light pleated aluminium diaphragm boasts a quick transient response. The mic is supplied in a padded nylon bag complete with a webbing pocket to stow the XLR plug at the end of the integral three-metre star-quad mic cable. The mic is supported by a fixed cradle, and the mic stand fitting at the bottom is connected through a flexible membrane to provide an effective shockmount. The mic itself is surprisingly light for its size — its dimensions are 300 x 70mm (8 x 2.7 inches), but it weighs only about 0.9kg (just under 2lbs). The front of the mic is marked by the AEA label, and the cable exits from the rear side, but just to make it even more obvious, a polar pattern is etched into the top of the mic showing the positive and negative pickup lobes. The serial number is etched into the silvered band around the bottom of the mic. Speaking of etching, you can apparently (at extra cost) have a logo or name of your choice engraved on the metal band at the top of the mic, should you wish. The user's handbook provides a lot of interesting information and advice, starting on the front cover, with three warnings: don't blow into the mic; phantom power can be dangerous; and keep the mic covered when not in use. The air pressure from blowing into a ribbon mic can cause the pleats to open and stretch, altering the tension across the diaphragm and thus the sound quality. Any air blasts are dangerous, including the thump when plugging a guitar into an amp if the mic is near the speaker. If in doubt, use a pop screen! The phantom power issue concerns defective cables. Under normal conditions, with correctly wired cables, ribbon mics and phantom power can get along without any problems. However, if the mic cable is damaged (shorting pin two or three to ground), or if the phantom supply is seriously unbalanced, then the resulting current flowing through the diaphragm will be sufficient to make it jump forward or back with enough force to snap it in half. No warning, no second chances, just one very dead mic. And this kind of damage is not covered by the warranty! So turning off the phantom power is a wise precaution, just in case — not strictly necessary, but sensible. The idea behind keeping the mic covered is to maximise its life, something which applies equally to all microphones, in fact, but is particularly important with ribbons. The big magnets can attract any stray ferrous particles from surfaces, which will gradually clog the gap between diaphragm and magnet pole pieces. Also, if the mic is covered, strong draughts — such as when a door is opened — won't be able to get in and stretch the diaphragm. AEA recommend keeping the mic in its padded case and stored vertically when not in use. Keeping the mic upright prevents the long ribbon element from sagging. When mounted on a stand, the carrying bag can be placed over the mic when it is not being used, in order to provide some further protection. Ribbon microphones, because of their constructional simplicity, tend to have accurate and consistent polar responses, and the R84 is no exception. This translates into quite wide usable areas in front and behind the mic capsule. However, a side-effect of the diaphragm geometry is that, whereas most microphones show a falling high-frequency response as the source moves off axis in the horizontal plane, the R84's HF response actually increases. The HF response also decreases as the sound moves off axis in the vertical plane. These characteristics can be used creatively to tailor the sound by altering the horizontal and vertical angles between mic and source. The technique is not too dissimilar to positioning a large-diaphragm condenser mic, although the effects are rather different. Should you be in any doubt as to the polarity of each face of the R84, markings on the top of the casing will set you straight.Photo: Mike CameronThe overall frequency response of the R84 is 'humped', for want of a better description. The response peaks at around 150Hz and falls away gently to either side. The LF response is about 2.5dB down by 20Hz, falling smoothly and progressively. The bass response is naturally enhanced by the proximity effect when close-miking, but because this is the intended role for the R84, the amount of boost is moderate and practical. The -3dB point at the high end is around 4kHz and the response continues to fall smoothly to around -6dB at 20kHz, with a slope of roughly 2dB/octave. However, despite the shape of the response, the mic doesn't sound dull at all; it sounds detailed and precise, but smooth and remarkably natural. AEA suggest that the sound quality is related to the diaphragm resonance. The end mounting arrangement of the ribbon gives a very low-Q resonant frequency around 50Hz, whereas the circular clamping and tensioning of a condenser mic's diaphragm tends to give high-Q resonances around 10kHz, which can lend a rather 'tizzy' quality to the sound — something which is entirely absent from the R84 and which becomes glaringly obvious in comparison! 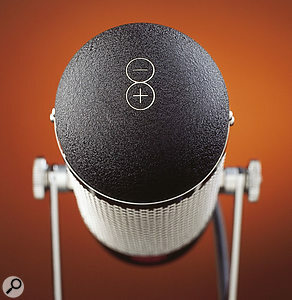 One other aspect of the R84's construction which affects its tonal quality is the use of two layers of grille cloth on the rear side of the mic, while there is only one on the front. This small difference imparts a subtle but useful character change on sounds presented to the front and rear, particularly affecting harmonics in the 6-12kHz area. 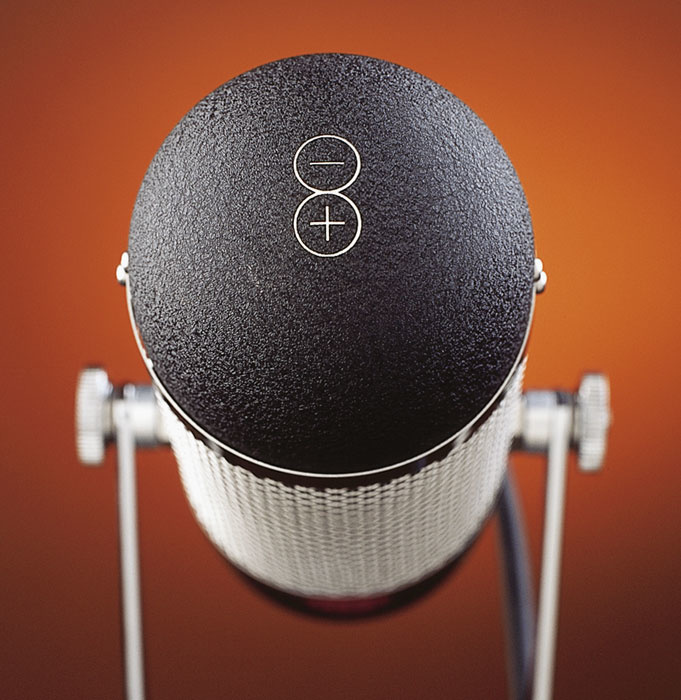 The handbook encourages users to make use of both sides of the mic, to take advantage of this tonal shaping. It also usefully points out that brass instruments and voices tend to deliver more energy in the positive (compression) half of the wave, and that if you are using the rear side of the mic it is advisable to switch the phase of the mic's output at the console to preserve absolute polarity. Although ribbons generally have low output levels, the R84's isn't too bad. Its nominal sensitivity is -54dBu or 2mV/Pa. For comparison, the Coles 4038 ribbon (a stalwart of the BBC radio studio) has a sensitivity of -64dBu or 0.5mV/Pa. So although the R84 requires a good preamplifier, it is not as demanding as some models, and because it is intended for close-miking applications the levels should be quite workable in practice. I was supplied with a pair of R84s for the review. They weren't specifically matched for stereo applications, although matched pairs can be supplied if required. I used them in conjunction with my GML preamps (which provide up to 75dB of gain), to mic up an acoustic guitar, a Hammond and Leslie combination, and a couple of voices. Even though they weren't specifically matched as a stereo pair, I found they worked remarkably well, both in X-Y and M&S arrangements, as well as in spaced arrangements. I am a bit of a fan of figure-of-eight patterns. They seem to have fallen out of favour with most engineers, but if used thoughtfully they can be far more useful and efficient than cardioid patterns. By arranging the two R84s in front of two vocalists, with the mics mounted one above the other at 90 degrees to each other (like an X-Y configuration, but with the outputs panned as if for dual-mono miking), I achieved over 18dB of separation, even though the vocalists were only a metre apart. The dead side of each mic was aimed at the unwanted vocalist, with the wanted vocalist exactly on axis. Provided care is taken to control reflections into the rear of the mics, this is a very effective technique indeed. A similar approach can be taken with a singing guitarist, using a pair of figure-of-eight mics, and the controlled proximity effect of the R84s suited this approach very well indeed. In fact, the R84 was far better suited for this kind of close miking application than the venerable Coles 4038, which tends to 'suffer' from a rather overblown bottom end when used in this way. With close-miked vocalists I found a pop screen to be necessary, but the integral shockmount was adequate at controlling vibrations through the stand. It was interesting to note that the sheer size and style of the R84 created quite an impact with the vocalists, and seemed to encourage good performances all on its own! The sound was never harsh or unpleasant, regardless of the source — the R84 seems to flatter everything in a very musical way. This mic always sounded smooth and mellow, but still managed to convey detail and precision in a very natural and appealing way. Capacitor mics certainly have their strengths, and for most people most of the time they provide the best combination of price, performance and practicality. However, the ribbon mic has a character and tonality all its own, and the R84 is a very good example of just what this technology has to offer. Many of the great recordings of the '40s, '50s and '60s owe their sound to the distinctively smooth and natural quality of ribbon mics. The R84 is certainly on a par with capacitor mics of a similar price, but it delivers a very different kind of sound which can become quite addictive, and makes a very worthy addition to a well-stocked mic cupboard. The figure-of-eight pattern won't suit every application or recording environment, but where it can be used the R84 makes a good alternative to any high-end condenser mic, and one I suspect many musicians may prefer once they have auditioned it for themselves. A large-geometry ribbon mic optimised specifically for close-miking applications, which is able to compete effectively on quality terms with capacitor mics in the same price bracket. The ribbon has a sonic character all its own, and one which is extremely seductive and flattering with pretty much any source. Output level is low, but not impracticably so.